View monthly rainfall data from your rainfall collection site. July 31 is the deadline for Risk Management Program (RMP) customers to pay their premium and report their second quarter and/or first semi-annual sales. Customers who chose to pay their premium in semi-annual installments will receive a second premium invoice in January 2014. More information is available on agricorp.com. Hot weather is coming. Do you have the Heat Stress in Livestock and Poultry App? The App allows producers to calculate the heat stress index on their smart phone by inputting the temperature in C or F and the relative humidity, either at that moment or by inputting the forecast temperature and relative humidity for later in the day. The producer then gets an output that links them to various management options they can use to reduce the potential heat stress on their animals. Now producers have a tool that readily puts the information they need at their fingertips, anytime, anywhere! 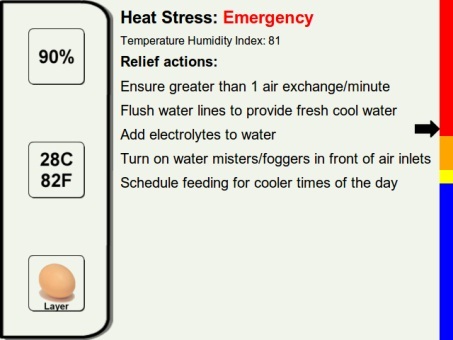 This is a picture of a page from the Heat Stress for Livestock and Poultry App. Guelph, ON, June 26, 2013 – The Agricultural Adaptation Council (AAC) is accepting applications from Ontario organizations and collaborations that want to put innovative ideas into action by growing profits, expanding markets and managing risk under Growing Forward 2 (GF2). Project implementation that focuses on the environment and climate change, animal and plant health, market development, labour productivity enhancement, assurance systems, and business and leadership development. AAC is delivering GF2 programming to Ontario organizations and collaborations on behalf of the Ontario Ministry of Agriculture and Food and Agriculture and Agri-Food Canada. Pre-proposals, applications and program guides can be found on the AAC website at http://www.adaptcouncil.org. Enrollment and online applications are available through the GF2 Client Portal. The AAC is based in Guelph, Ontario, Canada, and is a leader in program delivery. The AAC is a not-for-profit organization that is made up of 67 Ontario agricultural, agri-food and rural organizations. The AAC board of directors will review all applications from organizations and collaborations and make the final funding decisions. This programming is supported by GF2 a comprehensive federal-provincial-territorial agreement aimed at encouraging innovation, competitiveness and market development in Canada’s agri-food and agri-products sector.